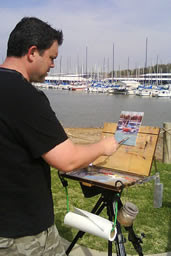 Randy Saffle - In the Field: Plein Air Painting Adventures: Celebrate the Day - 6" x 8"
Celebrate the Day - 6" x 8"
I went out to the local Marina for a little painting time and ended up painting a "little painting". I set myself up in a location that I didn't think I would have much of an audience. To my surprise I attracted quite the on lookers. Everyone was very pleasant and encouraging to me. When you have an audience and you're painting something you enjoy, it is an awesome feeling. It is very nerve racking when you have that same audience and the painting is not working. Luck was on my side. 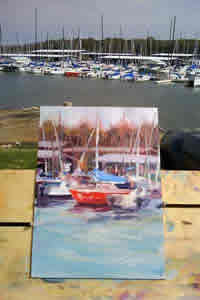 Not only did I end up liking this painting, but I was able to sell it to a very nice couple right off my easel. They said buying this painting would help them celebrate their purchase of their first home, so right then I knew the name of this work was "Celebrate the Day"
Rusty Truck 8" x 10"